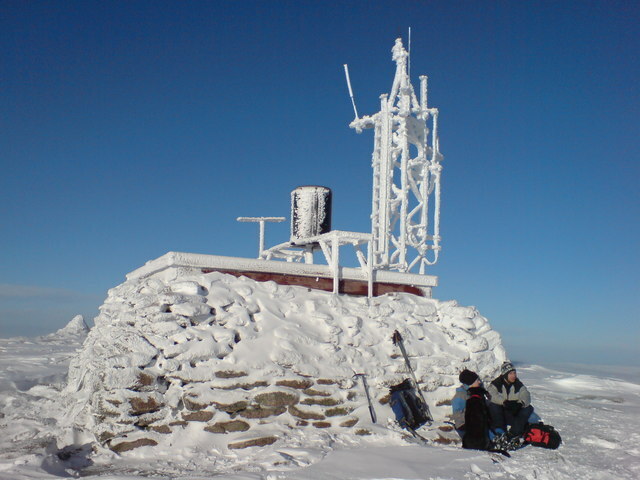 Image showing automatic weather station open to the elements, recording data briefly before retracting. Licence, click image for details. © Copyright John S Ross and licensed for reuse under this Creative Commons Licence. Click for more information. Hmm… there you are taking a brew out of the wind when this noise starts and a mushroom pops up. A stealth video camera is called for. An extreme weather mountain site. Be useful to link to the page linking the photo please. I’ve snow-holed on Cairngorm. A lot warmer than a tent, though you have to concentrate on what you’re doing to keep stuff dry. Updated, thanks. Tried reversing up from the photo hashed link, no luck. I hope they are the right location and of the same thing. Don’t know if the weather station has changed in recent years, but that brings back a memory. Post-pub, winter, over two decades ago, two of us set off up Cairngorm from the car park at the top of the road. It was about midnight, February, and we were worried that the weather was going to be bad the next day, so no time like the present to get a climb done. A beautiful moonlit ascent to the summit in still air. The weather station was unrecognisable, completely encrusted in snow/ice/rime. It just looked a large cairn. Just us, snow, ice, stars. Silence. Admiring the view, I suddenly heard a bizarre whirring noise and spotted what appeared to be a UFO rising from behind the “cairn”, just like the scout-probe on the ice planet of Hoth in “The Empire Strikes Back”. …Of course it was just the weather station taking a measurement out of an icy lid, but it frightened the bejeesus out of us for about 5 seconds.